The United States military has developed a number of Helicopter Armament Subsystems since the early 1960s. These systems are used for offensive and defensive purposes and make use of a wide variety of weapon types including, but not limited to machine guns, grenade launchers, autocannon, and rockets. Various systems are still in use, though many have become obsolete. 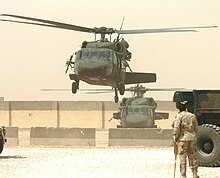 The United States Army was one of the first to experiment with helicopters, yet slow to fully explore the possibilities of armed helicopter gunships. An armed helicopter was proposed and rejected in the early 1940s. The Korean War experience prompted more experiments to explore the idea of air mobile tactics, and by 1962, armed helicopters, for attack and defense. That year saw the deployment of the UTTHCO (Utility Tactical Transport Helicopter Company) to help the South Vietnamese Army and to test new air mobile theory. Weapons used by UTTHCO were often crude and made from parts and weapons readily available in the field. With the arrival of dedicated gunship helicopters such as the AH-1 Cobra (since 1967) and later the AH-64 Apache, armament subsystems for non-specific types would begin to drop off, with mostly defensive armament packages remaining. Such armament packages, giving decidedly heavy armament to small or primarily transport helicopters, have become popular among second and third world countries who lack the funds for dedicated attack helicopters. Most of those systems bear some resemblance to the plethora of US systems that follow in this entry. 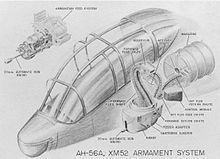 The M3, sometimes referred to as "Aerial Rocket Artillery" or ARA, consisted of two 2.75" 24-Tube rocket launchers, one on either side of the aircraft, along with a Mk 8 sight. The launchers fired in pairs, one from each side to prevent the aircraft from becoming off balance. M3 systems were attached to the helicopter using Bell designed stores racks. The only difference between the XM3 and XM3E1 was that the launch tubes on the E1 were 4" longer. The XM3E1 was standardized as the M3. 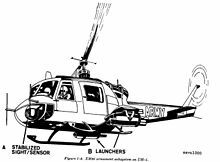 A subvariant of the M3 system was developed in 1964 by the US Army Limited War Laboratory that allowed equipped helicopters to produce a protective smoke screen. Called the Troop Landing Smoke Screen (TLSS), the system used modified M3 launch racks to dispense M8 smoke grenades. This system was later tested using M6 and M7 riot control grenades. With the development of the BGM-71 TOW missile Hughes had been given the contract to develop a launching system for the UH-1. By 1968 development had shifted over to development of a system for the AH-56 helicopter which was eventually canceled. The XM26 provided two 3-Tube launchers on either side of the aircraft, as well as the necessary sighting equipment. While the XM26 was more of a test platform, the two prototypes were deployed operationally as an emergency measure in South Vietnam to counter the Easter Invasion in 1972. Referred to as the Defensive Armament System or DAS, this system is composed of two mounts for GAU-15/A and GAU-16/A .50 caliber machine guns or GAU-17/A 7.62×51mm Miniguns, as well as, two BRU-20/A or BRU-21/A bomb racks for current 2.75" rocket launchers. 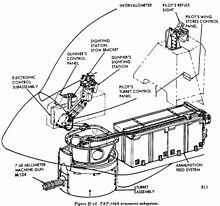 This system was also designed primarily for use with the UH-1N helicopter (and is in use with the US Marine Corps as well in this capacity), but is likely suitable for other long-fuselage UH-1 types. 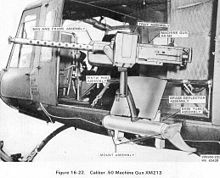 Developed to a Canadian requirement for their Bell UH-1N Twin Huey, the Mini-TAT replaced the M60s with a minigun. A number of these were loaned to the US Army for use during the famous J-CATCH experiments in the late 1970s. A version of the TAT-102 (Tactical Armament Turret-102) designed specifically for use on the HH-3A helicopter, the TAT-102C mounted a single M134 Minigun in a fully traversable turret (for specifics see the information for the TAT-102A in the AH-1 Cobra entry). Two such turrets were mounted on sponsons, one on each side of the aircraft. The complexity and questionable performance in the environment led to them being removed in favor of more conventional door mounted weaponry. The defensive armament system for the USAF's H-3E helicopters is described as standard to the HH-3E, and capable of being fitted as required to the CH-3E. The basic system comprises three M60 machine guns, one each at the forward door, the opposite emergency window, and the rear loading ramp. The forward two positions comprise pintle mounts on skate rails, while the rear loading ramp station comprises a pedestal mount on an armored floor plate. The floor plate slides on two tracks, forward and back, to and from its firing position at the edge of the ramp. Either the standard infantry M60 can be used, with standard 200-round ammunition boxes attached, or the M60D variant, feeding via flexible ammunition chutes from 750-round boxes fixed to the floor (or to the armored floor plate for the rear loading ramp position). 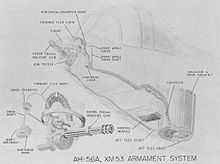 Described simply as a "2.75-inch rocket launcher subsystem for the CH-34," there is no information as to how many rockets the XM4 was capable of launching. For more information on the M6 Series see the UH-1 entry in this article. The XM6E1 was a variation of the XM6 for use with the CH-34 helicopter. A USMC weapon system to provide H-34 helicopters with offensive armament, the TK-1 (Temporary Kit-1) featured two M60C 7.62×51mm machine guns, fixed forward on the right side of the aircraft, with ammunition fed out from boxes inside the aircraft. Also attached to these assemblies were two pylons, fitted with 19-shot 2.75-inch rocket launchers. Aircraft equipped with the TK-1 were sometimes referred to as "Stingers." The XM-218, 0.50 caliber aircraft machine gun is a belt-fed, recoil-operated, air-cooled, alternate-feed weapon fired from the closed bolt position. It is capable of firing at a rapid rate of 750-850 rounds per minute. The M240D machine gun is a belt-fed, gas-operated, air-cooled, alternate-feed automatic weapon fired from the open bolt position. It has a rate of fire of 650-950 rounds per minute. 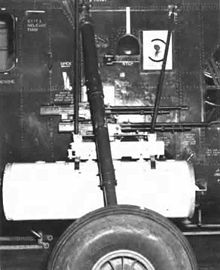 Defensive armament systems for the H-53 series and developments as used by the US Navy have no known designation, but generally comprise pintle mounts at "personnel or cargo doors or windows of the aircraft." These mounts are usually equipped with either .50 caliber (12.7 mm) GAU-15/A, GAU-16/A, or GAU-18/A machine guns, or 7.62 mm M60D machine guns. The .50 caliber weapons were later supplanted by the .50 caliber GAU-21/A machine gun, which featured a higher rate of fire. The M139 Volcano is a mine dispenser system composed of racks on both sides of the aircraft for up to 40 Canister, Mine, M87. Each canister contains 6 GATOR Anti-Tank mine and 1 GATOR Anti-Personnel Mine. Note: The US Army phased out the M60D in favor of the M240D and subsequently M240H, or M-134 Miniguns, but it is unknown whether the necessity of a new cradle for the weapon resulted in the system being redesignated. The mount is otherwise the same. The USAF equips its HH-60/MH-60 Pave Hawk with one or two GAU-15/A, GAU-16/A, or GAU-18/A .50 caliber machine guns, and or GAU-2 series 7.62mm NATO Miniguns. Example; One .50 caliber MG in the floor, firing out of an open door and two 7.62mm NATO miniguns mounted in the door gunner positions. The External Stores Support System (ESSS) provides two stub wings each with two hard points primarily for external fuel tanks, but, it can also carry various weapon systems. When equipped with the Extended Range Fuel System (ERFS), the system can support two 870 L (230 gal) or 1,700 L (450 gal) external tanks. The system feeds into the main fuel tank and not the engines directly. The ESSS can also be fitted with a wide range of weapons including up to sixteen AGM-114 Hellfire missiles, rockets and gun pods, and other systems. 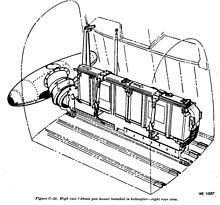 Still in development as of 2003, the Rapid Airborne Mine Clearance System (RAMICS) can be considered an armament subsystem (and one of the largest guns ever fitted to a helicopter), though its intended targets are strictly naval mines. 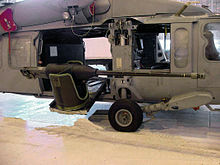 Consisting of a single modified Mk 44 Mod 0 30mm cannon firing the Mk 248 Mod 1 Armor-Piercing Fin-Stabilized Discarding-Sabot Tracer (APFSDS-T) round, the RAMICS was intended to be mounted in the cabin of the MH-60S helicopter, and using its associated sensor package, target and neutralize mines at relatively shallow depths. The system is designed to provide a quick and effective mine clearance capability to complement existing methods and others under development for the Navy's Airborne Mine Countermeasures (AMCM) Program. A version of the TAT-102 (Tactical Armament Turret-102) designed specifically for use on the HH-2C helicopter, the TAT-102K mounted a single M134 Minigun in a fully traversable turret (for specifics see the information for the TAT-102A in the AH-1 Cobra entry). A single such turret would mounted in the nose of the aircraft. The weight of the mount was not suitable for such a small helicopter and the turret was often removed. 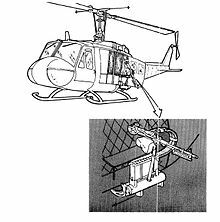 This system could also be mounted on the OH-58 Kiowa, and was tested on the YOH-5A during August 1964. 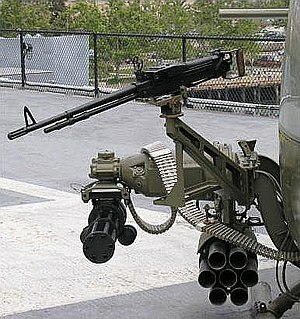 Using a mount similar to that used on the XM8 and M27 series, the HGS-55 was developed by the McDonnell Douglas Helicopter Company (formerly Hughes Helicopters) to use the EX 34 Mod 0 7.62×51mm chain gun. The weapon is supplied with a 2,000-round magazine, and the weapon fires between 550 and 700 rounds per minute. This system was not adopted by the US military for use, and no export sales were known to have been made. The M2 system was a variation on the XM1, replacing the .30-caliber M37C machine guns with 7.62×51mm NATO M60C machine guns. The mounts were similar to the XM1, also providing flexible elevation, with 650 rounds per gun stored externally. There are at least ten authorized armament configurations, which involve a mix of a system specific gun pod mounting the M296 .50 caliber machine gun (left side only), the M260 7-shot 2.75in/70mm Lightweight Launcher (LWL), the M279 2-rail AGM-114 Hellfire launcher, or a 2-shot Air-to-Air Stinger (ATAS) launcher. The gun pod is fed from a semi-external magazine loaded with 500 rounds of linked ammunition. The US Coast Guard has deployed the MH-68A to its newly created Helicopter Interdiction Tactical Squadron (HITRON), and it is the only helicopter in USCG inventory specifically tasked with the Airborne Use of Force (AUF) mission. These helicopters feature a defensive armament system composed of a single M240G mounted at the port cabin door, along with a Robar Arms RC-50 rifle attached to the cabin via a bungee cord for disabling hostile light vessels. The kit is also capable of being used on the HH-65C aircraft. When so fitted the aircraft is designated MH-65C. The Cobra Missile System is a functional development of the XM26 and the TOW missile system developed for the failed AH-56 helicopter. Originally designed for the AH-1Q and AH-1S Cobras, the AH-1F Modernized Cobra was also rebuilt to use the system. 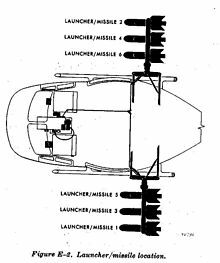 The original iteration of the system comprises launchers allowing for four BGM-71 TOW missiles per aircraft pylon to be carried, and a TSU or Telescopic Sight Unit, to allow for targeting and guidance of the missile. The TSU has been upgraded with the LAAT (Laser-Augmented Airborne TOW), a day/night range finder, and C-NITE (Cobra-Night Imaging Thermal Equipment), a thermal imagine/FLIR system specifically for the AH-1S and AH-1F Cobra helicopters. The Lockheed AH-56 Cheyenne got no further than operational testing of the ten prototypes before the program was cancelled. A nose turret with one M129 40 mm grenade launcher with 300 rounds. In light of the cancellation of the AH-56 was proposed as a replacement for the M5 system on the UH-1 helicopter. Designed to be interchangeable with the XM53. The only type classified subsystem for the AH-64 series, the M139 is composed of the Aerial Rocket Control System (giving the aircraft the ability to fire members of the Hydra 70/Mk 66 2.75 in/70 mm rocket family), a dispenser interface (controlling the M130 chaff/flare dispenser, also used on the AH-1 helicopter), and the Area Weapon Subsystem. ^ "The 20 Special Operations Squadron The Green Hornets 1944–1994"
Wikimedia Commons has media related to U.S. 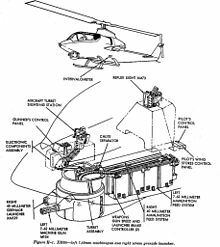 Helicopter Armament Subsystems.